Pembroke Townhouse is a superb boutique guesthouse offering exceptionally good service and attention to detail. It offers excellent accommodation and dining facilities at an affordable price. Located in an up market much sought after area The Pembroke Townhouse makes an ideal choice for the leisure or business guest. Past guests have been very impressed and many return over and over again. The beautifully designed ensuite bedrooms are individually designed and are decorated and fitted to the highest standards. The rooms proudly feature a collection of especially commissioned contemporary Irish art. All necessary facilities are available for convenience and comfort and Facilities in each room include direct dial telephone, cable television, safe and optional fax facilities .Wireless internet access is available throughout the Townhouse. The rooms are serviced by an elevator. The beautiful Deluxe Mezzanine rooms features a cd player, bathrobe and slippers, and complimentary mineral water. Ideally located on the exclusive, up market Pembroke Road Dublin 4 and is adjacent to the American and British Embassies, the Royal Dublin Society and Lansdowne Road. Just a five minute stroll brings the guest to the beautiful Herbert Park loved by romantic couples. The City Centre is just a ten minute walk and there the guest can enjoy superb shopping facilities in Grafton and Henry Street or enjoy the little Bohemian shops in Temple Bar. 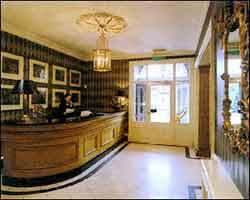 In the city centre the guest can enjoy the great tourist hot spots such as Trinity College, St. Stephens Green. Dail Eireann, The National Museum, The National Gallery and more.